When you can't ride to the trailhead, you need to get your broken bike to the shop, or you want to save your energy for your big group ride or race, a bike rack for your vehicle can make all the difference. Stop scuffing up your interior or leaving your bike sticking out of the trunk—with a car rack you can carry up to four bikes with no mess and no fuss. A trunk rack will fit on just about any car. These racks consist of a frame that is strapped or snapped on to the lid of your trunk or hatchback and supports a few bicycles on a strut that sticks out from the frame. Trunk racks are available to fit just about any car; the Saris Bones 3 Trunk Rack, for example, features an arc design that fits over most spoilers, while the Yakima QuickBack 3 Trunk Rack fits neatly on many cars, including SUVs, mini-vans, and hatchbacks. A bicycle is threaded on to the rack's strut, which supports the bike's top tube. These racks work best for bikes with reasonably straight-across top tubes—some mountain bikes and bikes with very sloped or curved top tubes may be less secure or stable on these racks. However, attaching the Yakima Tube Top Adapter to your bike can be a great way to get around that problem. If your car or truck has a towing hitch, you can attach a sturdy rack to the hitch. These racks are great for carrying particularly heavy bikes, since they tend to be lower to the ground—you don't have to lift the bike quite as high to get it securely mounted. Hitch racks have one of two basic constructions. 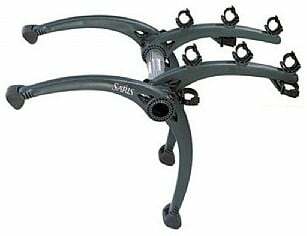 Some hitch racks, like the popular Yakima DoubleDown Ace 4 Hitch Rack, have struts, much like those on trunk racks, that support the top tubes of the bicycles it's carrying. 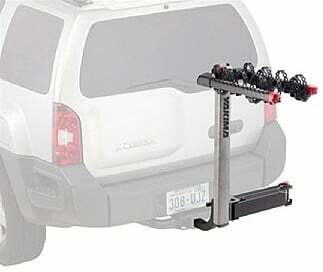 The Yakima ZDNU SwingDaddy Hitch Rack, another popular choice, swings to the side (even when loaded!) for easy to access to the rear of the car, making it an easy-to-use and practical option. 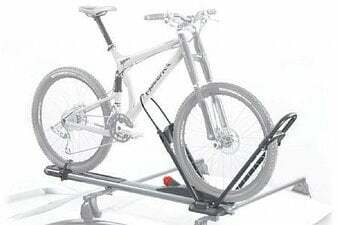 Others, like the Yakima HoldUp Hitch Rack, are tray-style and support the bike from below, making them more versatile and able to carry bikes of various shapes and sizes, even those without straight-across top tubes. It can even be expanded to hold up to four bikes with the Yakima HoldUp Plus 2 Hitch Rack Add-On. Roof racks require pre-existing rails installed on your car's roof, as well as crossbars, which you can install yourself (try the Yakima RailGrab/Crossbar Kit). Then you can add as many tray-style roof racks as your rack and crossbar combination can support (be sure to read the documentation so you don't overload your car!). The Yakima ForkLift Universal Roof Rack is a very popular roof rack that secures your bike with a skewer-style mount that holds your front fork securely, while the rear wheel fits neatly into a wheel tray and is strapped on. Can't or don't want to take off your front wheel? The Yakima FrontLoader Universal Roof Rack or the Yakima Highroller Roof Rack secure your bike to your roof by fitting over your front wheel, preventing sway. Whatever kind of automobile rack you choose, the ability to carry your bike wherever you need to take it will mean you can do more riding and less driving! We'd love to help you choose the right rack to meet your needs; call us at 1-800-682-0570 or drop us a line at [email protected] any time.